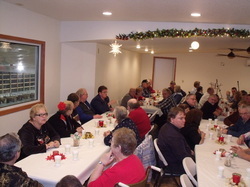 Cinnamon Ridge Farm is the perfect place to host your next corporate meeting, family reunion or youth event. We offer a unique experience that includes convenient parking. Our rental rates are reasonable and include audio visual equipment and an on-site kitchen. We offer two locations. See Rental Locations for more specifics. The event center is located over the barn overlooking the cows and robotic dairy. We can host up to 100 people. There is a food prep area or food can be catered in. See Rental Information for more specifics. The Dining Room is located in the Blue House. If you wish a more intimate setting, this may be for you. We offer a restaurant certified kitchen. In the loft, there is a disklavier piano that can play background music for you. We can prepare food for you or it can be catered in. See Rental Information for more specifics. Your next meeting or private event can be held at Cinnamon Ridge Farm's. Experience the unique setting of the robotic dairy or the picturesque, intimate dining room. See Rental Information for more specifics.